When darkness falls, on the 19th, the sky will look like the diagram above. 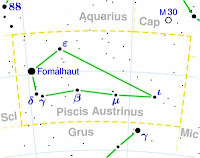 In the south, shines one of the brightest stars in the sky, Fomalhaut, brightest star in the constellation Piscis Austrinus. Piscis Austrinus (also known as Piscis Australis) is a constellation in the southern celestial hemisphere. The name is Latin for "the southern fish" in contrast with the larger constellation Pisces, which represents a pair of fishes. In Greek mythology, this constellation is known as the Great Fish and it is portrayed as swallowing the water being poured out by Aquarius, the water-bearer constellation. The two fish of the constellation Pisces are said to be the offspring of the Great Fish. In Egyptian mythology, this fish saved the life of the Egyptian goddess Isis, so she placed this fish and its descendants into the heavens as constellations of stars. Fomalhaut traditionally represents the mouth of the fish. Fomalhaut means "mouth of the whale", from the Arabic. It is a class A star on the main sequence approximately 25 light-years from Earth. It is classified as a Vega-like star that emits excess infrared radiation, indicating it is surrounded by a circumstellar disk. Fomalhaut holds a special significance in extrasolar planet research, as it is the center of the first stellar system with an extrasolar planet (Fomalhaut b) imaged at visible wavelengths. The image was published in Science in November 2008. Fomalhaut is believed to be a young star, only 100 to 300 million years old, with a potential lifespan of a billion years. The surface temperature of the star is around 8,751 K (15,292 °F; 8,478 °C). Compared to the Sun, its mass is about 2.1, its luminosity is about 18, and its diameter is roughly 1.8. Fomalhaut has a slightly lower proportion of elements with higher atomic numbers than helium: about 79% as much as the Sun. Fomalhaut is a member of the 16 stars belonging to the Castor Moving Group. 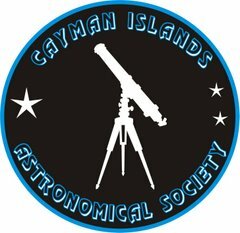 This is an association of stars that shares a common motion through space and are therefore likely to be physically associated. Other members of this group include Castor and Vega. This moving group has an estimated age of 200 ± 100 million years and originated from the same location. The nearby star TW Piscis Austrini, a member of this group, may form a physical pair with Fomalhaut. On November 13, 2008, astronomers announced the discovery of an extrasolar planet orbiting just inside the debris ring. This was the first extrasolar planet to be seen with visible light, captured by the Hubble Space Telescope. 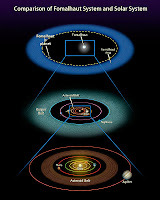 The planet's existence had been previously suspected from the sharp, elliptical inner edge of Fomalhaut's debris disk. The mass of the planet, Fomalhaut b, is estimated to be no more than three times the mass of Jupiter and at least the mass of Neptune.